Adapted to grow in dry climate locations in which few other plans can survive, this is a highly invasive plant with an extensive root system. If left unmanaged, it will form thick mats of itself and choke out other plants in its path. It produces burs with sharp spines that can lodge into almost anything. Folks typically don’t believe us when we tell them the goats will devour every last vine, but it is one of the first things they go for. This semi-evergreen, half-shrub has a deep tap root with an extensive fibrous root system. It is well adapted to a broad range of growing conditions found in the Intermountain West. This weed can take over an area quite quickly, with some publications stating a single plant can produce over 200,00 seeds in one year. This Winter annual species is considered highly invasive. It gets a head start on growth in the Winter so other beneficial plants are not able to compete fairly with its growth in the Spring. It is extremely flammable and has prickly awns that, when mature, can get picked up by animals and cause sores to form when skin is broken. The goats do best on this weed in the very early spring. If grazed early enough (roughly late February through mid May) the goats will wipe out that years cheat grass without damaging any beneficial bunch grasses that tend to start growing later in the year. Poison Hemlock has been introduced and naturalized in many other areas, including much of Asia, North America and Australia. Poison hemlock is often found on poorly drained soils, particularly near streams, ditches, and other surface water. Poison Hemlock contains several alkaloids, the most important and toxic of these being Coniine, which is a neurotoxin, that disrupts the workings of the central nervous system and is toxic to people and all classes of livestock. However, goats have a enzyme in their saliva that allows them to consume poison hemlock (as long as there are other options to eat as well) without harming the goat. A native of Eurasia, skeleton weed is one of the most invasive plants in Idaho. It spreads mostly by seed, and is capable of quickly taking over meadows and pastures. Goats are the perfect control method because they are able to fully digest skeleton weed–seeds and all. They won’t eat every last stem, but you won’t have a seed pod left! Canada thistle is a perennial weed that can grow up 1 to 4 foot tall and came to us from Eurasia, probably from a crop seed prior to 1800. This is the most widely spread weed we have in Idaho. This thistle usually has a pink flower but has also been seen with white ones. In the spring the rosettes are normally small and hairless and are not normally found alone, as many of the plant are connected by the roots. Although this plant, and other thistles, are completely edible by livestock and humans, they usually stay away from them due to the spines that grow along the leaf margins. A very palatable, high quality shrub for big game and livestock. It is slow growing with a deep root system. It can grow up to 6 feet tall and 8 feet in width. Goats also love bitterbrush. It is like candy to them! We frequently have customers who wish the goats would leave this plant alone, but once we explain the tremendous amount of oils contained in the plant (therefore making it a substantial fire issue) they typically understand the need to limit the presence of Bitterbrush. This is probably the most widely spread weed in North America. Due to it’s ability to be spread by the wind it can quickly establish itself in dry and moist areas. The plant releases a chemical which prevents other plants from growing near it (allelopathic) and the seed can remain viable for up to 8 years. The plant is rarely feed on by livestock and will replace the grasses and forbs in pasture and range situations. In fact in Montana there have been parcels of land that have been condemned by the authorities due to the abundance of the plant. A Winter annual grass with a shallow root system. Crowds out native species and forage for livestock. High silica (sand) content, degrades slowly, and is highly flammable. Do you have discounts for referring friends? 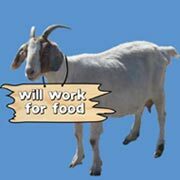 Yes if you and your neighbors all have weed problems and want us to come to work for all the neighbors we will either wave the set up fee or split it up to help lower the cost since we will not be moving the goats away from the area. The only time this discount is available is if the jobs are all run together and we do not have to leave and come back to the same area.